When I joined the JuntoTeam, I knew I was in for a unique experience but had no idea how unique it would be. Days after graduating from college, I found myself sitting in a Chicago office with a new team that instantly became my friends. After one week of warm welcomes and a self-guided onboarding process, I knew something about this company was different, but I couldn’t quite place my finger on it. Throughout my first three months, I’ve noticed the people around me grow in several different ways. Whether it’s the Apprentices, Mentors, Instructors, or my teammates, there is always some act of growing together that I witness. At Junto, not only does an individual grow, but people grow together with humanity, wisdom, and community. When it comes to humanity, I’ve learned that The Junto Institute is truly about the people. Every single person makes this a successful company and program, so it makes sense that the people always come first. I first witnessed this when being onboarded as a new JuntoTeam member. I quickly became aware of the idea of incorporating love into business, something everyone at Junto strives to do everyday. I was welcomed with warm hugs on my first day of work and soon found that hugs are common around Junto, which anyone will find out after any short interaction with the community. Soon after, I heard Chris Ruder, CEO of Spikeball (J2), transition from questioning the “soft skills” when he first joined Junto as an Apprentice to teaching the Leadership and Self-Awareness class for the JuntoV cohort. 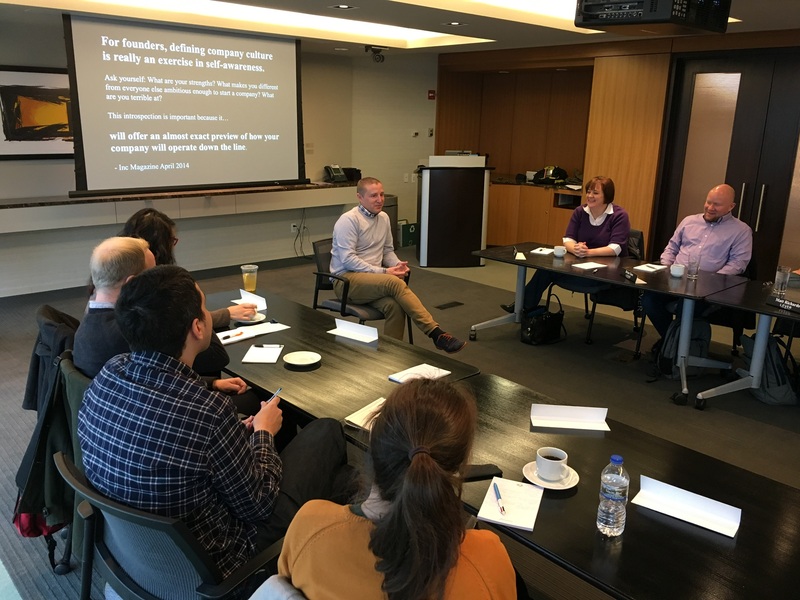 During the class, Chris mapped out his emotional intelligence journey, and the interesting thing about it was to see the vulnerability he displayed and how real it felt. "Vulnerability is not a weakness and we should stop thinking that," Chris stated during the class. He admitted that he was not always prone to this type of thinking, and started to focus on his interactions with people while going through the Apprenticeship program. Three years had passed since Chris was sitting in similar classes like the one he was teaching and it was obvious that he had grown as a person. Not only had he grown by stepping out of his comfort zone and into the role of Junto Instructor, but the JuntoV Apprentices were soaking up, reflecting on, and learning from the wisdom that Chris was sharing. In this moment, the Apprentices and Chris grew together. The amount of wisdom that surrounds me at work continues to amaze me. After graduating college as a business student only a few months ago, I feel like I am continuing to learn at Junto, but in a way many business schools never incorporate. Every day I am surrounded by individuals who have “been there, done that” and share their experiences with me, something that is more valuable than any MBA could be. Recently, I was surrounded by a profound amount of wisdom at the first Mentor Learning Session on emotional intelligence. 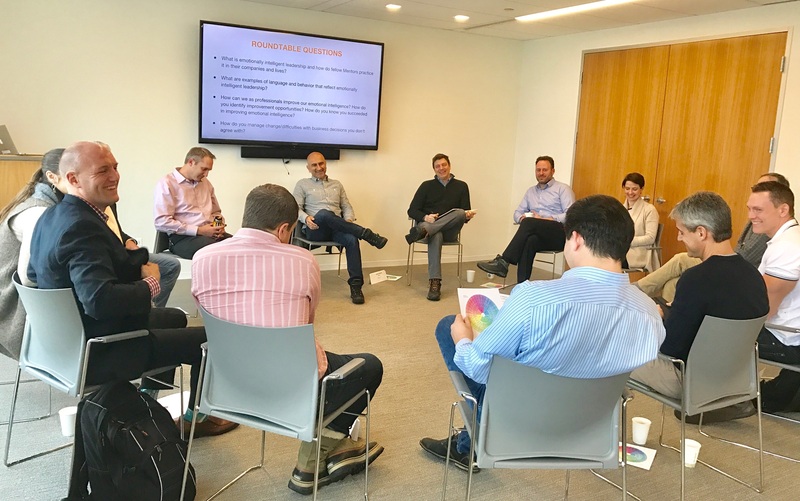 In this session, Junto Mentors gathered together to discuss what it meant to be emotionally intelligent leaders because, even as professional mentors with years of experience, they admit they are still learning. Throughout the session, they addressed questions like “How can we as professionals improve our emotional intelligence?” and “What are examples of language and behavior that reflect emotionally intelligent leadership?” Mentors, experienced and new, were present and sharing their ideas, experiences, and personal challenges of being an emotionally intelligent leader. I could feel the energy in the room and knew that I was witnessing something special. In that moment, everyone in the room was growing together. In my opinion, the coolest thing about The Junto Institute is the community of people that comes along with it. We are technically a small team of five people, but truly a community of over 200. We refer to this as the Tribe, and it is ever-growing. There are so many interesting stories of community throughout Junto’s history, but a recent happening stands out to me the most. 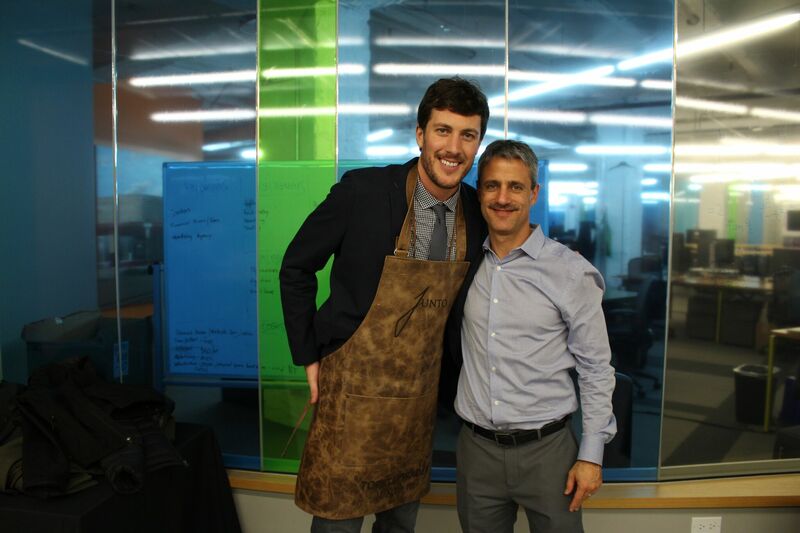 TopstepTrader (TST) was a part of the JuntoIII cohort and Jay Rudman served as their CEO Mentor, working closely with Michael Patak, TST’s founder and CEO. After the program ended, Jay stayed connected with the team as a close advisor, and then joined the company as Chief Growth Officer. The collaboration between Michael and Jay grew stronger and that led to a recent move, when Michael transitioned to Chief Visionary Officer and named Jay as the company’s new CEO. In this case, the Mentor and Mentee grew together, joined forces, and will continue to push the boundaries of growth and community, not only at TopstepTrader but also in the Junto Tribe. It’s stories like these that inspire me. They fuel my hunger to learn from, and grow through, my Junto experience. I continue to feel like a sponge in the room that soaks up whatever Junto will give me - any bit of knowledge, experience, and friendship that is placed on the table. At the age of 23, there is so much uncertainty that lies ahead for me but I am excited to grow with Junto. This is a business that cares, a community that teaches, and a Tribe that collaborates. At Junto, we grow together and push ourselves to new heights with humanity, wisdom, and community.